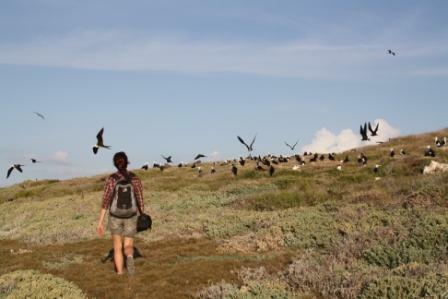 Louise Soanes, PhD student from the University’s School of Environmental Sciences, is photographed here walking through a colony of Frigate birds on Dog Island, near Anguilla in the Caribbean, as part of a collaborative project on the protection of the region’s seabirds. The population of seabirds on the Island, such as Frigates and Brown Boobies, have been under threat from rats that were found to be eating the seabird eggs. Following a rat eradication programme, Louise, working with Dr Jonathan Green, has joined with the Royal Society for the Protection of Birds (RSPB), Fauna and Flora International (FFI) and Anguilla National Trust to conserve and protect Anguilla’s seabirds. Louise said: “We are monitoring seabirds on Dog Island to provide baseline data on seabird abundance to understand if eradicating the rat problem on the Island has had a positive impact on the seabird breeding populations.